Time for a short recap of Mobileiron Live 2018! Making a summary of every presentation would be impossible, but let me highlight a few of the conference take-aways. To better protect your cloud services such as Salesforce or Office 365, Access is providing extra security. Access is not replacing your current IDP (in most cases ADFS), it adds an extra layer of device check (just like Sentry does for your mobile mail), and there’s more… Authenticator is a new feature that allows you to have seamless 2-factor authentication on your mobile device to access cloud services – on any device. Logging in on your desktop can trigger a notification on your mobile to ensure it’s really you! And than there’s SSO! Single Sign On – a much appreciated feature by every employee is now extended to cloud services on mobile devices thanks to Access! With zero-touch deployment of Android devices and better support to secure ‘any’ app for business, Android is rapidly increasing its market share in enterprises. Google got the message and have launched several initiatives to provide enterprise features on a broad scale, not only linked to specific vendors or software. This basically means that the guidance we provided last year on Android app development is confirmed (native AppConfig methods are to be used). It doesn’t come as a surprise that with consumer market saturation, the enterprise business gains more attention. 3. We want apps, more apps! macOS is growing fast and increased Q4 shipping with 10%! That’s a lot of new units, and a lot of those are going to the enterprise customers. Today we can manage a mac just like an iPad, it’s not only easy – but the good thing is that we know exactly how it needs to be done and the infrastructure to make it happen is already in place! Yes, that includes secure connections to the back-end systems, from wherever you are. If you would like the conference presentations on a specific topic, please let us know! We’ll also be publishing more white papers in the coming weeks on integration with M365 and more. For several years mobco supports the KOTK 1000 km event in May. This year we supported the Don Bosco Technical College of Halle and one of the Barry Callebaut teams. Big thank you to the cyclists and enthusiasts collecting all the funds for the cancer research! Seris, expert in guarding and security solutions, is a mobco customer and has made a deliberate choice for a specific configuration to turn standard smartphones into task devices. The rationale are clear, when apps are critical for the business and the safety of the employee, the solution needs to work all the time. mobco implemented a solution that allows zero-touch roll-out and full remote control over the device configuration and apps. An impressive improvement in service quality and better communication cost control resulted from the project. Devices dedicated to work, check the video below on the successful collaboration of Seris and mobco. Thank you Erik Van Dam, ICT coordinator SERIS and Danny Vandormael, CEO of Seris! 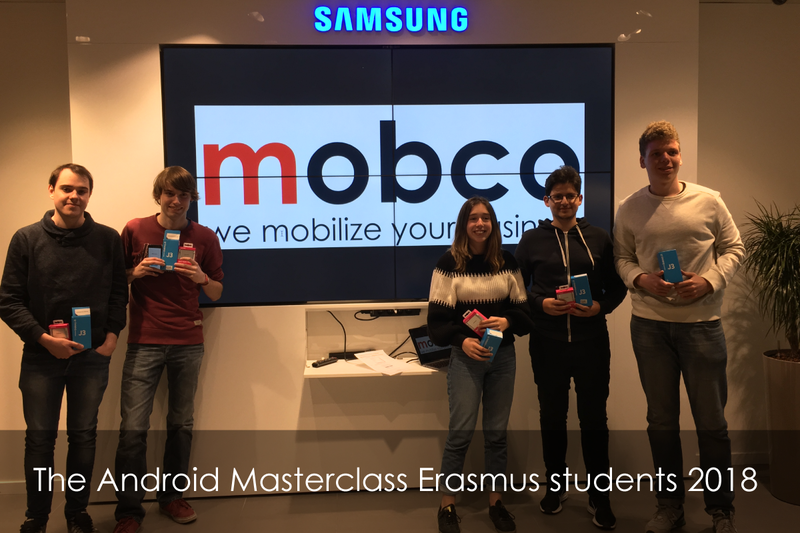 We’re delighted to announce the first class young graduates of our Android Masterclass 2018 at Samsung! We organise several Masterclasses on different deep dive topics, typically the IT staff of our customers attend these classes to sharpen their mobile expertise. 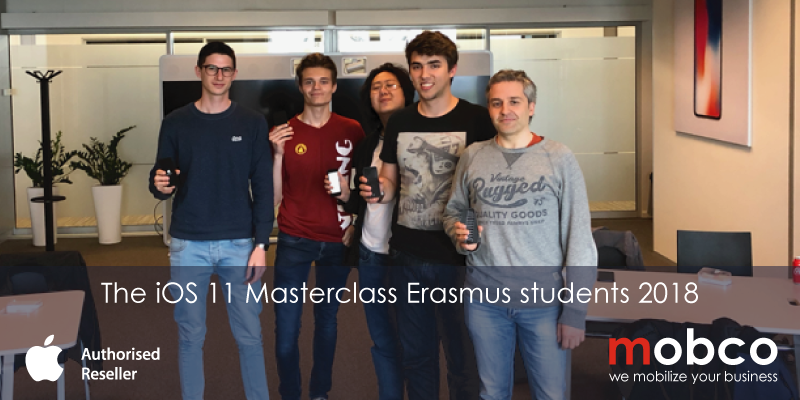 As of now, we have set-up a separate track for Erasmus students! The idea: allow IT students to taste the Enterprise side of mobile IT. Thanks to Jochen of Samsung and Björn for the great support and congratulations to the first student graduates of our Android Masterclass 2018! On April 17th, a sunny spring Tuesday in Zürich, the member CEOs of the Enterprise Mobility Expert Alliance (EMEA) are welcomed by Philipp Klomp, CEO of Nomasis (nomasis.ch) at their headquarters. It’s time for a strategy update of the largest community of mobile IT experts in Europe! The success of the alliance has been proven over the past years and created a clear benefit for the member companies AND their clients. “Expertise sharing was the main focus for the technical teams and resulted in a better customer service with quicker response times,” says Martin Blattmann, responsible for engineering and support at Nomasis. Building upon the clear technical expertise benefit, the EMEA members agreed to shift gears and expand their collaboration model with a coordinated product and service offering. “Now it’s time to take EMEA to the next level!” stated Markus Adolph, managing partner and founder of EBF (ebf.de), representing the largest member of EMEA. Ronan Murphy, CEO of CWSI (cwsi.ie) “With the updated alliance strategy we have basically set the golden standard for mobile IT projects.” The services provided by the members of the alliance are converging towards a high standard, valid across Europe. EMEA provides a quality label for expert services in mobile IT! On top of the software that is acquired from top vendors in Enterprise Mobility, the members have all invested in niche solutions complementing the readily available software. “We fix the issues we encounter in enterprise implementations that requires specific development,” says Ulrik Van Schepdael, CEO mobco (mob.co). With the new EMEA strategy, the enterprise grade software solutions are now available to all customers across Europe. The next step for EMEA is to put even more of a focus on the customer experience. EMEA members provide the best quality service, unequaled expertise and the broadest product portfolio to truly support mobile business transformation. More information on the alliance can be found at emea.mobi . We’re delighted to announce the first young graduates of our iOS Masterclass 2018 at Apple! Thanks to .K of Apple and Björn for the great support and congratulations to the first student graduates of our iOS Masterclass 2018! mobco is one of the founding members of the Enterprise Mobility Expert Alliance, EMEA. This alliance is no holding structure or commercial vehicle, it brings together mobco alike companies from across Europe to share mobile expertise! In enterprises across Europe we often encounter similar challenges that mobile IT system integrators try solve in the best possible matter. Sharing expertise with Nomasis (Swiss), EBF (Germany) and CWSI (Ireland) has been proven to be very successful. All mobile IT engineers share a common communication platform, product experiences and most important, product validations are happening better and faster, thanks to the EMEA. CIO Applications magazine spotted the biggest pool of mobile IT expertise and wrote a nice article about it you can find here. The 11.3 release brings major new features for iOS most of the enterprises have been asking for since a long time. Controlling the iOS upgrade process is one of the most requested restrictions and appears on every IT department’s wish list – now included in the latest iOS release! Another big one concerns the corporate contacts on iOS devices. With the upcoming GDPR every company needs to take the appropriate measures to protect personal information, including contact details. The new protection mechanism allows you to make professional contacts, typically originating from your Exchange, only available to your designated apps (your own or apps you selected from the app store). But there is so much more to discover that we’ve decided the write a white paper including relevant new feature AND to organise a Masterclass on the new iOS. During the workshop we’ll go through all the known and less known features + how to control and manage those feature; a must-attend-Masterclass for every professional responsible for a fleet of iOS devices! Check our mobco academy to register for the upcoming Masterclass ! Download the definite enterprise guide for iOS 11.3 here ! When we think about mobile we often see the ‘extra’ benefit. Only recently we hear companies talking publicly about their mobile-only projects; meaning the employee will only have their mobile device for work and will no longer require a PC. An unstoppable evolution. The Katchilé project enables the Forever Chocolate strategy of the world’s largest chocolate producing company; by 2025 they have set their ambitions to eradicate child labor in the supply chain, lift more than 500.000 cocoa farmers out of poverty, become carbon and forest positive and have 100% sustainable ingredients in all products. Mobile is changing our planet fast and making it a better place to live in, for everybody. Proud to be part of that change. Warm greetings from the mobco team! It’s true. There are too many passwords, login screens and an endles series of ‘yes’ buttons you just have to click to continue in the process. There must be something better? And there is! With the Device Enrolment Program (DEP) we make life easy for your IT staff AND for your employee!! Take a brand new iPhone or iPad, unopened box, give it to your employee and … wait. Trust us, if your employee is not capable of making it work there is a hardware issue with the device. mobco is an Authorized Apple Enterprise Reseller and we know how to make things easy, from hardware purchase at the very best commercial conditions up to the production part and end-user support. See our movie of one of our devices enrolling in EMM. No apple ID required. No credit card required. No personal email address. Open the box and enjoy the magic!